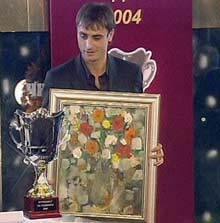 Bayer Leverkusen's striker Dimitar Berbatov became Bulgaria's best footballer for 2004. At a special ceremony organized in Sofia Berbatov received the cup by Bulgaria's President Georgi Parvanov, who wished him luck and more goals. I want to express my gratitude to my colleagues from the national football team to whom I owe that award, Berbatov said. Lecce's Valeri Bojinov, also called the whiz kid of Bulgaria's football was ranked second, while Wolfsburg's star Martin Petrov became third in the ranking. The other footballer in the top ten are as follows: 4. Vladimir Manchev,5-6 Stilian Petrov and Marian Hristov, 7-8 Radostin Kishishev and Martin Kamburov, 9. Chavdar Yankov and 10 Hristo Yanev and Iliyan Stoyanov. Hristo Stoitchkov was named Coach of the Year and was also awarded by President Parvanov. "What we started with the boys that year is just the beginning", Stoitchkov said when receiving the award.